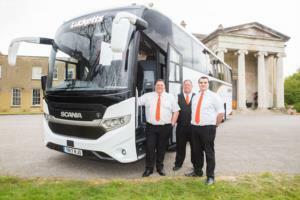 Coach firm Lucketts Group is launching a major recruitment drive as it sees the results of its growth plan taking hold. The company is holding a special recruitment event at Fareham Shopping Centre on March 12, when it hopes to set the wheels in motion for recruiting a large number of new drivers. Managing director Tony Lawman says: “We set out our ambitious growth plans just over a year ago and, looking at our forecasts, this summer is when we’ll really be seeing the fruits of our labour coming through. We’re set for a rise in demand for our services across the board, with more and more schools and corporate work, as well as a boost across our already popular day trips and holidays. Those who make it through the recruitment process can expect the unique perks that come with working for Lucketts. There will be the chance to see new places through varied work and ongoing training to develop in their careers. The company runs coach holidays in Europe so for some there’ll also be the potential to work abroad in places like the Alps, Paris and Spain. The company also offers a range of staff benefits, like access to the Perkbox discount scheme and free enrolment in the Travel Benevolent Fund. Roles will be available across the Lucketts Travel, Coliseum Coaches and Worthing Coaches parts of the Lucketts Group. The Lucketts driver recruitment event runs from 9am to 3pm.